As 21-year-old rookies, Stan Musial and Albert Pujols hit September grand slams that helped propel the Cardinals toward postseason berths. On Sept, 22, 1942, the Pirates led the Cardinals, 3-0, in the fifth inning at Sportsman’s Park in St. Louis. A string of Pirates misplays helped the Cardinals score twice in the inning before loading the bases with one out. Musial stepped to the plate against starter Rip Sewell. In 1941, after Musial had been promoted from the minors to the Cardinals in September, he hit his first big-league home run against Sewell on Sept. 23 at Forbes Field in Pittsburgh. The two-run homer came in the fifth inning and stretched the Cardinals’ lead to 6-0 in a game they would win 9-0. A year later, Musial was facing Sewell again, this time with the bases loaded and a chance to erase a 3-2 Pirates lead. The grand slam also was Musial’s 10th and final home run of the 1942 season. He finished his first full year in the majors with a .315 batting average, 72 RBI and 147 hits in 140 games. Nearly 60 years later, on Sept. 21, 2001, Pujols and the Cardinals were playing the Pirates in Pittsburgh. They entered the ninth with the score tied at 5-5. Facing reliever Omar Olivares, who spent his first five seasons with St. Louis, the Cardinals loaded the bases with one out, bringing Pujols to the plate. Olivares threw a sinker, hoping to induce Pujols to hit a double-play grounder. Instead, Pujols lofted the pitch over the fence for his grand slam and a 9-5 Cardinals lead. With the victory, their eighth in a row, the Cardinals moved to 3.5 games behind the first-place Astros in the National League Central. The Astros and Cardinals would finish tied for first at 93-69, with St. Louis qualifying for the postseason in a wild-card berth. With that home run, his 36th of the season, Pujols broke Johnny Frederick’s National League rookie record for extra-base hits in a season, with 83. Frederick had 82 for the 1929 Dodgers. “I believe this is the best year I’ve ever seen a position player have for a club that I’ve been on,” Cardinals manager Tony La Russa said. 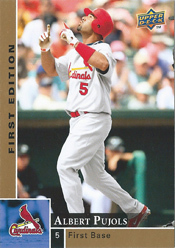 Pujols finished the 2001 season with a .329 batting average, 37 home runs, 130 RBI and 194 hits in 161 games. He was the unanimous choice of all 32 voters for the National League Rookie of the Year Award. Pujols would go on to hit a franchise-record 12 grand slams for the Cardinals. Musial has the next-best total, with nine grand slams for St. Louis.